One of my colleagues asked me if it is possible to make multiple selections in a drop-down list in Excel. When you create a drop-down list, you can only make one selection. If you select another item, the first one is replaced with the new selection. He wanted to make multiple selections from the same drop down in such a way that the selections get added to the already present value in the cell. There is no way you can do this with Excel in-built features. The only way is to use a VBA code, which runs whenever you make a selection and adds the selected value to the existing value. In this tutorial, I will show you how to make multiple selections in an Excel drop down list (with repetition and without repetition). This has been one of the most popular Excel tutorials on this site. Since I get a lot ofsimilar questions, I have decided to create an FAQ section at the end of this tutorial. So if you have any questions after reading this, please check out the FAQ section first. Adding the VBA code to the back-end. Select the cell or range of cells where you want the drop-down list to appear (C2 in this example). In the Data Validation dialogue box, within the settings tab, select ‘List’ as Validation Criteria. In Source field, select the cells which have the items that you want in the drop down. Now, cell C2 has a drop-down list which shows the items names in A2:A6. As of now, we have a drop-down list where you can select one item at a time (as shown below). To enable this drop-down to allow us to make multiple selections, we need to add the VBA code in the back end. The next two sections of this tutorial will give you the VBA code to allow multiple selections in the drop-down list (with and without repetition). 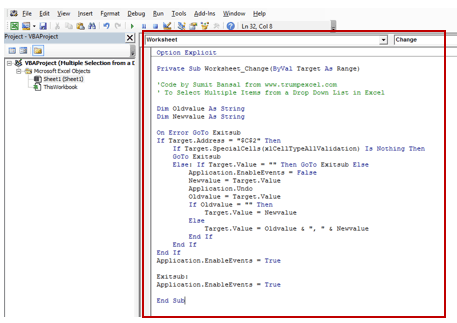 Now you need to place this code in a module in VB Editor (as shown below in the ‘Where to put the VBA code’ section’). When you have placed this code in the backend (covered later in this tutorial), it will allow you make multiple selections in the drop down (as shown below). Note that if you select an item more than once, it will be entered again (repetition is allowed). A lot of people have been asking about the code to select multiple items from a drop down list without repetition. 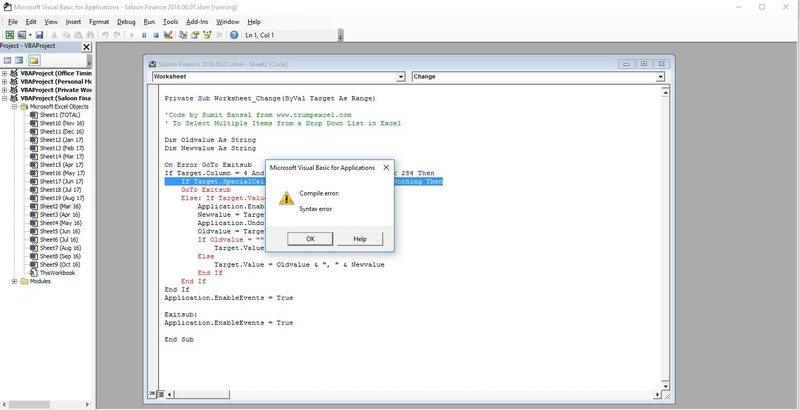 Now you need to place this code in a module in VB Editor (as shown in the next section of this tutorial). This code will allow you to select multiple items from the drop down list. However, you will only be able to select an item only once. If you try and select it again, nothing would happen (as shown below). Before you start using this code in excel, you need to put it in the back-end, such that it gets fired whenever there is any change in the drop-down selection. Go to the Developer Tab and click on Visual Basic (you can also use the keyboard shortcut – Alt + F11). 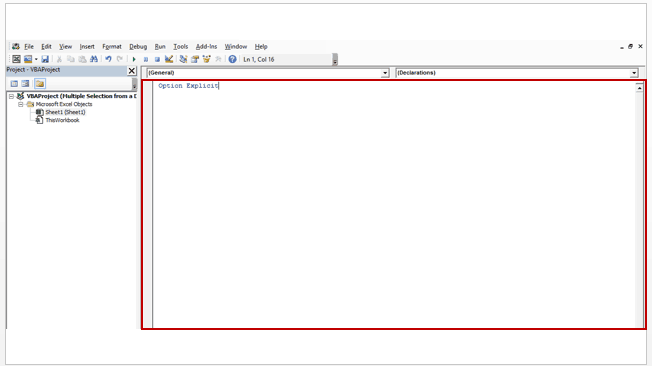 This will open the Visual Basic Editor. Double click on Worksheet Name (in the left pane) where the drop-down list resides. This opens the code window for that worksheet. In the code window, copy and paste the above code. 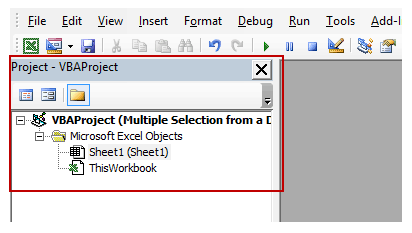 Note: Since we are using a VBA code to get this done, you need to save the workbook with a .xls or .xlsm extension. I have created this section to answer some of the most asked questions about this tutorial and the VBA code. If you have any questions, I request you to go through this list of queries first. Q: In the VBA code, the functionality is for cell C2 only. How do I get it for other cells? Q: I need to create multiple drop-downs in entire column 'C'. How do I get this for all the cells in the columns with multi-select functionality? Q: I need to create multiple drop-downs in a row. How can I do this? Q: As of now, the multiple selections are separated by a comma. How can I change this to separate these with space (or any other separator). Q: Can I get each selection in a separate line in the same cell? vbNewLine inserts a new line in the same cell. So whenever you make a selection from the drop-down, it will be inserted in a new line. Q: Can I make the multiple selection functionality work in a protected sheet? Second, you need to make sure the cells - that have the drop-down with multiple selection functionality - are not locked when you protect the entire sheet. Display Main and Subcategory in Drop Down List in Excel. The XLSM file with VB scripts when opened in other PCs the VB script doesn’t work. Why? Incredibly helpful tutorial – thank you! The code was really helpful.Thank you.But if there is an option “All” in the list, how to include that so that once this option is selected,no other option can be selected. Thank you for this quick fix, great! How do I lock the values of a cell (data range) when I make a table of many rows? Each new row creates a new range of data values, selection +1 for each new row. How can I remove a selected item in a multiple drop down list? How do I apply this to other columns and cells within the same sheet? So easy to understand and replicate in my documents. Thank you! Can you please help with another issue I have in regards to macros and multiple section of various sheets for PDF conversion and/or printing. Can I make the multiple selection functionality work in a sheet protected with a Password? I found this solution worked perfectly, but when I opened the workbook again the ability to make multiple selections no longer worked. I notice Rachel also commented below having the same issue. Is there a fix? Hi Karen. I fixed this by clicking the ‘Enable Content’ button in the yellow bar when you first open up the workbook. Otherwise the macros are disabled. In case of multiple columns, if dropdown is not there and user manually enter the data, that data also concatenating. For e.g. IF target column is C, now enter 1 and press enter, then press 2 and enter. Both digits concatenated(1, 2). How to stop this? Hello! How do you make the items are sorted alphabetical in every cell? Hi Sumit. This really great and helpful. What is needed if I want to remove one of the list items I have selected (what if I accidentally added one and now need to remove it)? Thank you for your help. Hi Michael, I would like to know this also, did you find a solution? I am too looking for a solution to remove an item from the list. I need to create multiple drop-downs in all the rows. How can I do this? These steps work perfectly, but when I close the file and reopen, I can no longer select multiple items. I’ve tried several fixes. Any thoughts? This is great but what if I make a wrong selection. How do you then remove or change it? Hello, I’m working with Excel Online, and do not have a developer tab. Is there a way to do this on the online version? This was exactly what I needed. Followed your steps and it worked perfectly! Thank you!! Using your multiple option list – I am trying to put in more than “one change action” on a worksheet and it wasn’t working. I tried a few more things and still no dice. Do you have the code that you could share? I am sure there is a trick to it. When I protect the worksheet, it will not allow users to multiselect in the cell. Is there a way to fix that? This is great. Thank you for sharing the code. I want to do more out of this, however, there are some problems.For eg., I cannot delete anything added by error. My teammates running this on Mac face problem where the highlighted value from the list gets added if one wishes to abort by pressing ESC. Any ideas on how to implement such changes ? FANTASTIC! WORKED LIKE A CHARM Thank you. how to make the list visible while selecting more than one item from the list. now if i want to select 3 items from my list, i have to click 3 times and select each one separately. would more convenient if the list stays open until i finish selecting my items. Thank you, this is helpful! In my list, I have a wildcard (Other: ***), that I want people to be able to replace with an additional response. However, when I do that with the above code, it copies what I have listed and then shows it again with my changes. i.e. : First choose “Option 1”, then chose “Option: ***” which I change to “Option 4”. The output is “Option 1,Option ***,Option 1, Option 4”. I want to get rid of “Option ***” and “Option 4”. Thank you, Sumit for this very helpful instruction. I have the same issue as Benny. I have a list of stakeholder names and want to provide people with the option to write the name of a stakeholder outside of my list. Disabling the Error Alert in data validation allows me to do that. However, when someone selects an option (e.g., finance) from the list and then writes the name of a new stakeholder, I get: Finance, New Stakeholder, Finance, New Stakeholder. Is there any way to fix this to make sure we get the same results whether people type before or after selecting from the existing list? I need to create multiple drop-downs in multiple columns (like C and F). How do I get this for all the cells in these columns with multi-select functionality? very informative. can you please tell me how to apply multiple selections in multiple column in a protected sheet? I have Excel 2010 and cant seem to get this to work. Any ideas? Amazing! Thank you so much for sharing your expertise! I had never used any code of any kind in Excel and your step-by-step tutorial made this simple to execute. Is there any way to modify the code so that I can manually drag a cell’s contents into another part of the table? In the table I have built, each user has one entry per row, but they should be allowed to drag that cell to another column in the same row. As the code stands, the only way to do this is to delete the cell’s contents and retype it in the new column, which is not ideal. I really need to know if there is a code that allows to remove the selected object in the multiple selection list. Please, it will be really helpful. Do you know if Excel have the function to have fillable group populate after you select from a selection list? Thanks Sumit for this excellent trick. This worked like a charm. Can you please advise, how can I now count the number of selections made? I just finished using your code for reoccurring choices. Thanks, it works great. My next task is to work on exporting it to an Access DB. First, Thank you. This is extremely helpful and it worked! I just have one issue. It changed my date format. My list has a date format of mmm-yyyy. When I add this VBA code it allowed multiple selection, but changed the date format from DEC-2018 to 12/01/2018. Is there someplace in this code I can specify the date format mmm-yyyy?? Thank you in advance! Greatly appreciative of the help. How can unselect item from selected? I have copied your VBA without repetition but it doesn’t seem to work. Note I made two changes – (1) replaced the target address to $B$9 and (2) the spacing between selections from “,” to vbNewLine. Can you please give me ideas why this doesn not seem to work? It worked like a charm, instruction and layout is very clean and clear. thank you so much! Hi I have just built my spreadsheet which is perfect. Now I need to make one of my drop downs editable. When you put other and want to put in an explanation. I’d like to alpha sort the multi pick list results so that the list displays alphabetically, not in the order it was selected. Any suggestions? So I figured this out now – I just needed to replace 3 with 16. However, I can see that there is a problem trying to deselect an item. I see other queries about this – is there a way to do that please. had to make a few changes to your code. Here is what your final code looks like inserted in the original “without repetition code” provided by Sumit Bansal. I have managed to get each selection to be on a separate line within the same cell, however when using that cell to place on another sheet within the same workbook the two are pushed together again. Is it possible to adjust this? Facing the same issue if you know the answer please let me know. How do you deselect an item? I used the code without repetition, but now I want to deselect and item, but nothing happens and I can not delete the item. For example I select one, two from drop down list. Now I do not want two, how do I get rid of it? Thank you. Hi there, this doesn’t work when I protect the worksheet. I am using this code to make a rudimentary form, so I want to protect the other cells from editing. The cells that contain the dropdown are not protected but the vba still doesn’t work. As soon as I protect the worksheet the drop downs only allow a single selection. What can I do to make this work. My apologies if this is answered somewhere and I didn’t see it. Thanks for the great site and sharing your Knowledge! This worked and was so easy! Thank you so much! I’ve managed to do everything but my multiple choices still kicks out the previous choice. I have gone to address and changed it to column and on $c$2 to 4 as I want the whole column. I’m doing this for a non for profit service dog trainers so we r not techies. I thought I was following the directions is my software or system too old? It really need this little thing it could change our who training program. Thank you in advance I feel you were very easy to follow but I am missing something. Hi Sumit – your VBA instructions are great and I love that you’ve thought about all the other uses (ie duplicates / non duplicates, separate line in cell) as it’s perfect for what I want! I’ve done some tests which all work fine and will add the code to my working spreadsheet. Fingers crossed! I noticed that after adding the codes that allows me to select item once, I can’t delete the last input if it was incorrectly selected. It will give me validation error message. How do I counter this issue? can I applied this for other columns in the same worksheet? You are brilliant! thank you very much for posting this. It seems to work great!! Thank you for this code, works great. How do you deselect an item? I used the code that does not allow selection of the same item but now I want to deselect but nothing happens and i can not delete the item. For example I select one, two from drop down list. Now i do not want two, how do i get rid of it. Thank you. How do I alter this code so that there is an ending row for the multiple selections of the drop-down list? For example, I have a table on excel with a drop-down list in columns 2 and 3 (B and C). I would like to alter this function so that at the bottom of this table, the function stops. I would also like to be able to use functions, such as count in column 4 which is D, on excel. All help is appreciated, thanks so much! I cannot make it work. I downloaded the file to see what the problem was and I cannot make it work with that either. I can still only have one selection from my dropdown box. What am i doing wrong? Thanks for the tutorial but I think I must have missed something. I put information for drop down list in Sheet 2. Sheet 1 – created drop down list and targetted information in Sheet 2. Pressed Alt-F11 and got the Visual Basic for Applications (VBA) screen, selected Sheet 1, pasted the code and closed VBA. Tried to select more than one item from drop down list and only got one item showing at a time. Reopened VBA, deleted code from Sheet 1 and copied the code to Sheet 2 then closed VBA. Not sure if need to have a particular cell or sheet selected before Alt F11? Using Microsoft Office 365 ProPlus. How can I get the code to choose items in a dependent dropdown list? Suppose I have a different list in each dropdown? I copied and pasted the code and it works!!! now, how do you sumifs multiple values from multiple drop down list using named ranges ? i.e. suming multiple product groupings as well as multiple regions . Hi, How can i get this to apply to multiple worksheets? i have read your drop-down multiple selection post (without repetitions). it worked perfectly fine,but whenever i am closing worksheet all data validation get deleted how to solve this problem. When making multiple selections, how do you then delete a selection you may have accidentally clicked? that is also what I was going to question. Only deleting entire value works currently. AWESOME! This deletes the unwanted list item via “reselecting it” in the dropdown. Thank you! 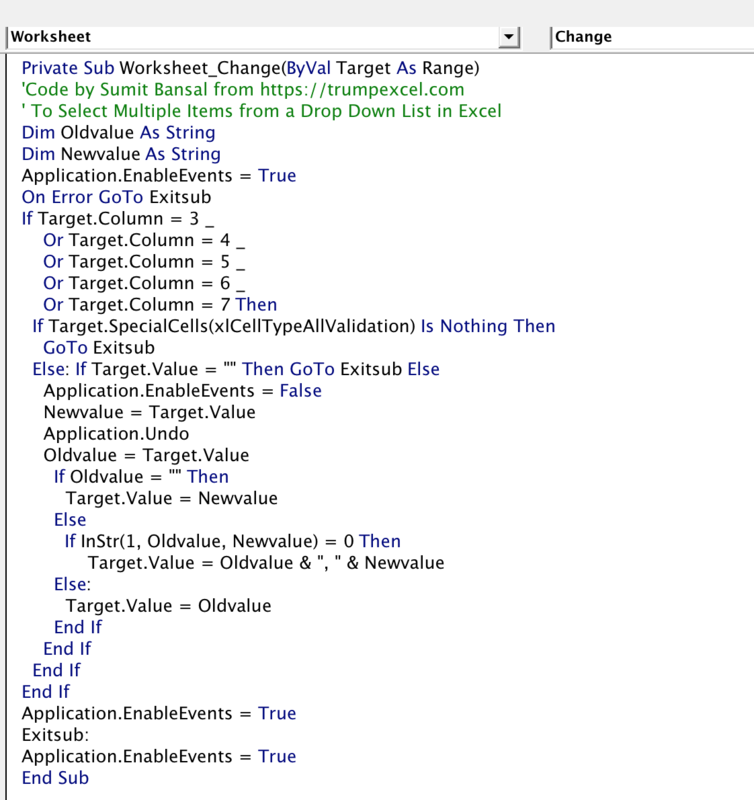 I plug in the VBA code and changed it to If Target.Column = H, but it does not work. I still cannot select multiple answers. Hi, I recently changed the Columns numbers in the VBA code because the applicable Columns changed location and now I’m getting compile errors. However, it worked just fine before I changed the column numbers. After the error it highlights the “.Column” portion of the first “If Target.Column” instance. Not sure why I’m getting this error. I had changed the VBA column numbers several times before this while creating the Workbook and it worked fine, but something is messed up now. Please help. Is there a way to count the items later on if they are listed in a multiple list? 1. I tried your solution and put the list in the same sheet (A3-A5) as the cell (E3) where I wanted the multiple selection, but its not working for some reason. It is just picking 1 value. The sheet is IssueLog. 2. I have the Standard list in one Worksheet ‘ReferenceInfo’ and I want to implement the multiple selection in another worksheet ‘IssueLog’ in column E (E3 to E300). Can it be done? I downloaded the sample to select multiple items. When selecting items, only one displays. What needs to be done to activate the display of multiple items? I have to add multiple questions some that requires only one answer and other multiple. How can you create list without all of them being multiple selection. can you clarify the following. I have my spreadsheet with multiple columns on sheet 1 and the dropdown list choices which is to be used for column F (on sheet 1) is listed on Sheet 2. Would I paste in the code above on the VBA Editor sheet 1 or 2? Hello, sorry if this question has been asked before. How about selecting multiple entries in the dropdown listbox ? Something like ctl + click or so to select multiple entries at once. I’m really thankful to you as this code too useful for me, but i have a one query when my sheet is protect then this code isn’t work. Please help me out i just want to use this code if my sheet is protect with password. Its very useful tutorials from your website. But, how can we limit in selecting only max 3 values from drop down list. HI, Happy 2018!! I downloaded the example file but it is not working. Any security settings in Excel that I must change? Thank you. I saw code to get this to work while the sheet is protected, and that worked great. However, when I shared the workbook it stopped working and kept giving debug pop-ups. Is there a way to use this function while sharing a protected workbook? I have indirect lookups off the back of a drop down and if i choose multiple options in the first cell then my lookup no longer works, is there a solution to this? This is a little bit late, but I just came across this and have a couple questions. Is there a way to limit the amount of selections one can make in a drop down list to say, 5? Currently there’s roughly ~200 items in the list and I only want them to be able to select a maximum of 5 of those at a time. Also, say I have the same list in all of column 7 and 8, would I be able to have a command that tells the user that once something is selected in column 7 they can no longer select it in column 8 or vice versa? Hi Sumit – Thank you for this great information! I have an additional question… We have a worksheet with many picklists, and I am using this code for all multi-select picklists. We do allow the user to enter a new value if needed. Then we use “circle invalid data” to find the new values that have been added. However, when using “circle invalid data” on the multi-select picklists, it ALWAYS circles the cell if there is more than one value entered, even if they are valid choices. Is there a way to get “circle invalid data” to work properly with the multi-select columns? If not, is there something we could add to the code, to “highlight” those values that the user added (that are not valid)? Column 2 is dependent to Column 1. Thanks so much! Really useful, and just saved me hours of brain hurt! First off, many thanks for the code, it made my research that much easier! I was just wondering whether this will be compatible when computing statistical analysis in Studio R; can I conduct tests on excel cells with multiple items? Thanks you for this code, it works fine ! I used it on an entire column, and I want to filter by choice (say if i choose “one, two, three”, I want to that cell to come up if I filter for “two”). Is that possible ? Every time I save the workbook, my coding disappears when I reopen the document. Can someone please help??? Thanks for the solution..its works fine…however it is being applied to all the cells in the sheet and I am not able to edit the cells even where there is no drop down menu to choose from. Can i choose the columns to which this code should be applicable? This solution is OK, but what if you want to delete values? So https://uploads.disquscdn.com/images/f49a89e68134ae908e184e590a5b4e052ec9548648b51162600b703cceefebff.jpg I have produced an advanced solution. YOu can dowload the code for free. It uses check-boxes and is far more useful. I cannot get this to work, even with the file I downloaded. I enabled the macros and still did not work. I am using Excel 2016. Could this be the issue? Do you have a solution? Download it from here, it is free easy to understand. It uses Listboxes and checkboxes. Will enable you to select multiple values from this drop down list menu. In my dropdown list have a several option where each option have their own values. when i choose in the dropdown for Grape,Banana,Apple the excel will look for the lowest value among the option i had choose. In this case, the excel will find that Banana have the lowest value among the option i had choose hence the value showed up is 2. Hi, is there any way to add scrolling feature to the drop down? Hi, I’ve used the code successfully but now it does not work after an update of Excel version 15.39 (171010). It can only contain one value in the field. Should I change something in the code to make it work again? Anyway to limit the number of entries? I’d like to only be able to select a maximum of 5 entries. I have a formula in F5 on the sheet that counts the number of separators (I used “;” instead of “, “) that adds 1 since for 5 entries there would only be four semi colons. I want a message box to appear when F5 has a value of 5 and then exit the sub. Hi I have tried this code and still cannot select more than one drop down from my list. are you able to help. Thanks so much very easy to follow and worked the first time. Is there a way to do this using a key combination instead of a comma to delimit the selections? Hi. This has been extremely helpful, but I have my drop down list on one sheet and the cell on another. How do I code for that? I am also trying to use a date picker so that when my teachers click on a cell, they can have a calendar pop up to click on. Can you address that issue or tell me where I can find the answer? Thank you. The function does not work. what might I be doing wrong? Hi, I was able to get the code to work, but when an email marco was attached to the spreadsheet it quit working. What have I done wrong? How can I count the number of each selection? I tried countif but it does not seem to be working. I’m having a difficult time implementing this solution for my particular use case. In my spreadsheet, I am applying data validation on the fly first — in other words, every time I click on a cell in a given range on my sheet “User Lists” it checks the header of that column, looks for that value in the header row on “User Picklists” and then if it finds it it uses the list from that page as the list for data validation on User Lists. Some of the columns need to be Multi-Select though, so once that code block runs, I have used yours immediately below it. Hi. Nice post. I am looking for a dropdown list where I can (really) multi-select. e.g. holding the Ctrl or Shift key. Here with your solution I have to select each one-by-one. Ctrl-A to select all would be also nice. This is a great code and for the most part it’s worked well for me. I’m trying to apply this to a range of cells from B3:H1012. Can you please advise what part of the code needs to be changed? I would also appreciate if you can let me know the code it needs to be changed with. Thanks a lot in advance!!! Hello, this code works great. Thank you for sharing this great work. Unfortunately, I’ve come across an issue not yet addressed here. I need to protect the worksheet, but once I do that the code no longer works. Is there a solution for this? Thank you! Hello, Both of the codes worked great! However I am trying to combine both of the codes in the same file (workbook). One column I need to select multiple item with repetition and the other I need to select multiple items without repetition. How do I combine these? I tried to use your code and I am getting my list from sheet 2 and I can get the drop down to allow me to pick one name but I am unable to to pick more than one. I assume it has to do with the way I am tying is into the sheet 2. Should I be using the Target.Address = “$F$6” or Sheet2!A1:A12 where my list is. Hello Ben.. The code needs to be in the sheet in which it’s supposed to run. In this case, if you multiple selection to work in Sheet 2, you need to place the code in Sheet2 code window in VBA backend. This was working great and it just stopped working suddenly. Not sure why. Never mind, figured it out. Macro security, make sure after an office 365 update you turn your macro security trust back off otherwise it might block this code. Can we put multiple VBAs in the same sheet for different cells having separate dropdown lists.. I tried it does not work. And yes, you can also add mulriple VBA codes as well, however, it may not be necessary in this case. I followed the instructions. How do I apply it to C2:C42? When I scroll down in my worksheet, the drop down box loses the ability to select more than one option. I had it working then it stopped. I need to be able to select from a list into a full column. Hello, using a VBA code similar to yours, I am selecting multiple items in a drop down list that are separated by comma. The code I am using is to edit and add multiple items in a drop down in the same cell. I am trying to create a pivot table with independent filters instead of all the line items in each cell. For example, in my drop down list, in one cell, I selected apple orange and banana, and in another cell, I have kiwi orange and banana, however, I just want to focus on the banana independently that occurred each time. Is this possible at all? Or will I have to resort to traditional excel and create a cell for every single item. (Really what I am doing is monitoring donor/patient reactions, so I am selecting for example, nausea, loss of consciousness, etc, and where the conditions were mild, moderate, and severe and how many times in a mild reaction did a donor have nausea symptoms or something). Hope there’s something to do this! I just like that the drop down feature makes one column instead of a million different columns but I really need it to analyze my data. Thanks! I have the same exact question. i’ve been looking everywhere for a solution!! I even asked on the microsoft excel community for help.. maybe there will be a glimpse hope for us!! lol! This is an excellent layout and step by step instruction. Thank you so much! I have been trying to change the code to where the multiple list selections appear unduplicated across the row in separate columns. Do you have the VBA code know where in the above listed one I can edit to make that happen? Hi Sumit .. Thanks a ton for sharing this .. the code works fine for me 🙂 on a unprotected sheet. It stops the moment the sheet is protected .. my apologies if this has already been answered as i am unable to find any threads on password related issue for this VBA command .. Please help!! I used the code above to allow for multiple selections, and then I used the modification from Sumit Bansal to modify it work for all of the drop downs in my worksheet. This worked great! Thanks! Now my problem is that in the header row of my table I can’t make any changes. Any time I try to make changes the text keeps multiplying instead of deleting. I am thinking that this might have to do with the fact that I had converted this spreadsheet to a table before I add the dropdowns and code. So the header row had it’s own built in sorting/filtering dropdowns that the code may be messing with?? Regardless it is huge table and now I am not sure what to do with it, and would appreciate any suggestions. My header row is mess and everything I try to do to fix it is making it worse. Hi – thanks for providing the VBA code, seems to work great. Is it possible to limit the selections to a certain number? I.e. 5 choices w/the option of selecting a maximum of 3 without repetition. Thanks, I look forward to hearing back from you. Thank you Sumit for your tutorial for setting up Multiple Selection Drop Down lists…it worked very well and was very helpful! I would however like to have the multiple selections I make from the Drop Down List I created in in Column 3-Row 5, to be displayed down in Column 2- Rows 5 thru 10 instead of side by side in the same cell separated by a comma…I can’t seem to find an example of the VBA Code I could use to accomplish this…Can you please provide an example for this scenario? Thanks! Hi, This is exactly what I need, followed all your instructions and even downloaded your sample file, unfortunately it just is not working, I have changed the settings to allow VBA projects, am I missing something! thanks so much! it works beautifully! Just had one problem: why does it refrain me from editing other cells? Rather than have the output read “one, two, three” I would like it to read “one, two and three”. Or “one and three” etc. Is this doable? Is there a way to tweak your code so that each drop down selection appears on a new line within the cell (rather than separated by commas)? What if my dropdown lists are in a different sheet than the dropdown data? Hi, thanks for the great code. I have it working on 4 separate columns in a file I have, but there is a strange issue I’m seeing. If I enter data in a cell directly in front of one of the columns I have the VBA code running against and then either tab into or right arrow into the coded column, the cell highlight will jump back to the cell I came from. It then also runs the VBA code against that cell now too. Example: column B has the VBA code applied to it, column A does not. If I enter any data into column A, press TAB to go to the next cell in the row which is in column B. The cell highlight moves to column B, briefly, then jumps back to column A. If I had for example entered “1” in the cell in column A prior to pressing TAB, if I then enter “2” in that same cell, the VBA code will make the data in the column A cell be: “1, 2”. Any clue on what I can change in the code to keep this from happening? Here’s my version of the code posted here, which is based on the code posted for keeping duplication of choices from happening. It looks for column headers by title to determine which columns to run the script on. Hello. For some reason I can not get the code to work. I copied and pasted the same way you did but it still does not work. What am I doing wrong?? I am having the same issue. Do I need to modify any of the code for my dropdown cells? Yes, yes I did. I substituted $C$2 for the correct cells in my sheet, and it worked! I am new to VBA, so I’m sorry for the silly question. Thanks for the code! @sumitbansal23:disqus Hi Summit, your code worked great for non repetition. I noticed the values selected appear in cell window. Besides that feature is there a way to keep the chosen values from the dropdown list highlighted and erase selected value by double clicking on them? Ultimately I am following up with a code that will hide selected columns depending on the values appearing in the cell chosen from your code. Any advice on that? I tried to manipulate the code to account for 2 columns to be able to select multiple items but having trouble. Can anyone help? Hi, this worked perfectly, thank you. But I cannot remove any item from the selection unless I delete the entire entry. How to get the selected column header name for the selected cell. Is there a way to add a Sum of all the values collected? I’d like to be able to sum the value of all the items selected and then use the sum in another formula. Dear Sumit, thanks for the great code! I run into a problem when I lock the sheet, then the macro stops. I am going to share my sheet with others and need the lock specific cells. Do you have any suggestions how to solve this problem? Thanks for your time! How do you take the validation out so I can add text to the end of the cell, text that isn’t in the dropdown? Is there a way to deselect something from the list if it was clicked by accident? Sumit – thanks for putting this up, this was exactly what I was looking for. One question – once I’ve implemented this on my spreadsheet, I may create pivot tables using the data contained therein. Is there a way to force the pivot table to treat each selection in one cell separately instead of creating a new category defined as all multiple selections? let me know if you ever found a solution! Hi Sumit, not sure if you are still active, but I want to thank you for this work. You are wonderful, and this material is so helpful. Hi Great Post, Its very helpful,Thanks a lot. I Want to know is it possible to know the selected items to be highlighted in the drop down if yes please help us to do that. thanks in advance. Hey Karthi.. I don’t think it’s possible to apply any kind of formatting in the drop down. Hello, this is super helpful, thanks! Only thing is I can only get this to work when I use it alone without any other VBA code, but as soon as I use additional code to have my sheet perform other functions, my drop-down list reverts to only accepting one option at a time. Below is the code – any ideas how I can get it all to work? My other two commands are for time stamps in two different places on the same sheet. The other two commands still work when I combine all the code, but the ability to choose more than one option from the drop-down menu stops working. I believe these codes are interfering as both sets of codes (your and mine) is fired when you try to use the drop down in W3. What are you trying to get done with your code in the beginning? Hello, The Code works well for the list put in other columns where I have some descriptive copy I have been having issues making changes to the content when this code is present. Have you run into this issue? Hello Sumit, thank you for this expansive tutorial, I used this solution now but have a follow up question: I want to use the multiple entry result cell as input for another list lookup function. E.g. My multiple entry cell looks like “Item 1, Item 4, Item 4, Item 10” so far, so good. The final result in another cell should be the sum of the values of these items ( e.g. 1$+4$+4$+10$ = 19$). Is that possible and if so, how? – Thank you very much for your time! Nice. You just turn a “I don’t know if I can do that” into a 2 minute chore. You rock Sumit! Once you select options, is there a way to edit in Excel? Example – clicked on desired drop down item, but would now like to add additional information into cell. I am getting an error message. I saved on format as reccomeneded. But when I reopen it it stops working. Any one know why ? you need to save your excel spreadsheet as a macro enabled spreadsheet. go to file, save as, and then when you see the title, it says save as type … and select excel macro enabled workbook (*.xlsm). now the code will be saved everytime you open and close. Thanks for the post. What if you have more than one column in the spreadsheet that you want to set up dropdown menu with multiple data point selection? I think I have looked through all the comments to find this and don’t see it, how do I point the code to look at a different sheet within the workbook for the list of options? I have created the list on Sheet 2 A2:A27 and the drop down box I need populated are on Sheet 1 C10 &D10 which is a merged cell. I have never done VBA coding so please help. Thank you. Hi, Sumit. Thanks for the code it works great. I would like to add a carriage return at the end of each selection. Is it possible ? And, is it possible to edit the selection, like adding a person name in the selection. ex: John needs to walk 15 minutes twice a day ? Tanks. You’re amazing ! Thank you so much! Problem: I have a excel file that i must send to many of my colleagues, my question is, how can i send it with the code so they wont have to paste it in VBA? Using XLS or XLSM format does not work for me but i succeeded using XLSXM format. Hi, I’ve tried everyone’s version of this VBA code and no one’s is working. I have created the data validation drop down list, ez pz, but regardless of the code I paste in, I don’t get these results. I am using Excel 2013 and the worksheet/book isn’t protected. I am simply trying to get multiple choices in the same cell. The code I have provided above only works for cell C2. You will have to change the line Target.Address = “$C$2” to make it work for your cell. Yeah, I read through a million of these comments and saw that, which I changed of course. Turns out, I needed to save and exit for the code to run and work. Strange! What do I use for a range of cells in place of $C$2? You are THE man. Thank you. Your posts are fantastic Sumit. Thanks. Can you help me with this issue. I have created the dropdown list with multiple entries without repetition and would like to know if each selection can be on a separate line in the cell and not separated by a , (comma). Your help would be appreciated and I am generally useless at VBA, but your info and tutorials have been super helpful. Glad you found the tutorial useful Lara. You are a star…. thank you. Your help is amazing. Sumit – I’ve used your code to set up drop down lists in three separate columns, without repetition. It works like a Boss. Now, Like Lara above, I would also like to delete accidental entries. Some code from another source was supplied in the discussion above, but it doesn’t do the line breaks. I’m a complete beginner with VBA, and can’t see how to adapt one to the other. Any advice? Thanks. Sumit – this is brilliant! It has really helped me. Thank you. ElseIf Target.Value = Oldvalue Then ‘<~~~ This prevents self-duplication. but is there a way to combine both these things? I've tried combining these lines with this NewLine code but haven't been able to achieve both happening. I know almost nothing about code. Any help is much appreciated! Great code here. The problem is (keep in mind it may be on my end), the code is not working. I even downloaded your code, and tried running it on my machine, and I still am only able to select one of the drop list items. Is it possible there is a security setting I missed? I have enabled macro’s, and allowed trust access to VBA project object model, but again, the code doesn’t work. Please help. Also, is it possible, to have the code work on several different cells (copy and paste drop down) and have the VBA code changed to accommodate? I am trying to make a drop down selection list down over 260 line selections. I essentially need to copy the drop down to that many, and allow for selection as I go through the line items. Thanks again. Go to the Data tab and click on Data Validaiton. In the data validation dialog box, in the Error Alert tab, change the from Stop to Information. Now you will be able to make the changes and enter manually in the cell. This has been really helpful, thank you so much. Is it possible to make this VBA code work when a sheet is protected? is it possible to use a reference to the table and column? Table1[column1]? Hello, I followed the instructions and it worked perfectly. Is it possible to edit the above code so that when you click multiple selections it forms a list down multiple cells in a column, rather than in one cell separated by commas? Thank you for your great work! If I need to select some Items and then add those in the cell, how can I make this? hi did you ever figure this out?? Hello, How to I create multiple selections as a list in a new column rather than getting values separated by coma in same cell? Hi Sumit, thanks for the codes. The multi-select list worked great but I have issue with the existing single-select list. Before I added your code, validation for the single-select list worked. I only could select the value from the list. But after I added your codes, the validation for single-select list didn’t work. I was able to enter any values to the single-select list and I didn’t get an error message. If I only select the value from the list then it’s fine. But I still could enter any value and the cell will accept it. Do you know how to fix this? Thanks so much for your help! If I have to delete an entry from the list, it does not behave the way it should. Have you tried that? I would like to know a solution for this also. Great macro thanks! TRUMP RULES! I am having the same issue…any answers??? Hello Sumit, thank you for supplying such helpful information, I have used the code and works well, not sure if this has been covered yet, but is there a way for the selected data to display down the column instead of in the one cell? I came across your code chunk, and for the most part it works well. Thank you for posting. This was really helpful. Hi Sumit, id you give an solution to this problem. I cannot seem to find a solution here. Hi thank you for this nice tutorial. Now, instead of separating the multiple selections by a comma, I want to add the additional selections in the adjacent cells in the same row. But still have the feature of removing previously selected items. Can you please help me with that? How does the code need to be changed if, instead of separating the multiple selection by a comma, the additional selections are added in separate cells in the same row? But still with the replacing feature included? Hi, I’ve been looking for this. This is a very great tip. Thank you so much for this advise. The code worked great and I was so happy with finally being able to add my products within the same cell. The next day however I went to open the file and now the code isn’t working??? It just went back to normal> I saved it as a Macro as well. Does anyone know what I can do to fix this issue??? Hi Sumit. I have read through all of the posts and it has helped me a lot. Just one more question if you don’t mind. I need a secondary list to select the items from that would only display the items that I selected in the first list. Please help me out as I am working for a company and this database needs this function immediately for me to start entering the data in it accordingly. Thank You for your post and your help. Thank you for sharing your code. I am able to get it to work except that when I make a 2nd selection (or 3rd, 4th, etc. ), I get a green triangle trace error in the cell. 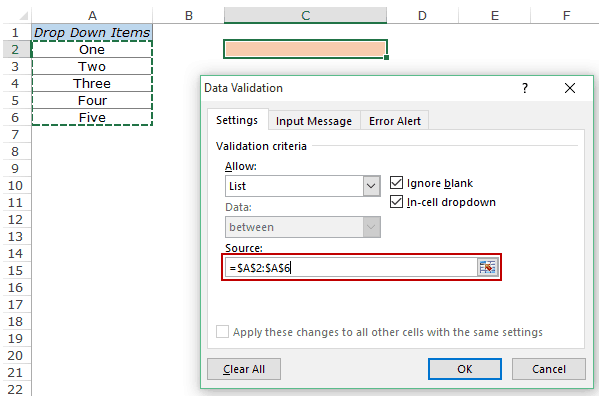 It is saying that the value doesn’t match the data validation restrictions defined for the cell. Do you know what may be causing this and how to fix it? I’ve been playing around with this some more and have realized that the error only appears when I have my spreadsheet formatted as a table. I’m not sure why, but when it is not formatted, there is no error. Is there any way to fix this or change the code to address this? Hey.. I tried converting the data into a table and see if I could replicate the error. It worked fine for me. Would be great if you could share your file. Can have a look and see what’s causing that. Thanks, Sumit. I tried creating this in new worksheets as well, having the same problem. I would create the drop down list and it would work fine. But as soon as I “format as table” the trace error appears. How can I send you the file? Hi Sumit, Thanks for the code, but after I close it, I cannot run it. Usually I assign the maro to a shape box, but since it is a drop down menu, I couldnt assign a macro name and it is not running. Wondering why? Thanks! I’m struggling a bit with what looks like others have been able to solve below. I have a spreadsheet where I’d like to enable multiple pick lists in columns E, M, and N only (down to row 100 or so in each). I don’t want multiple pick list in the other columns. Can you tell me exactly what to enter for the code? I’d be most grateful for your guidance. Hi, when i attempt to filter a column that has cells with more than one value- the filtering system cannot pick out individual values, and instead picks them all per cell. Is there anyway to filter based on ONE value for all the cells(those that have many values and those that have one-separated by a comma? Thanks. This was very useful. Precisely what I needed. This is great! Thank you so much for this. I have one question though. I’ve read the comments and can’t find the same question being asked – apologize if I missed it. I am able to select multiple options from a dropdown box successfully, however I can’t find a way to them remove one of the options unless I clear the entire cell. For example, I select options such that my cell looks like: Apple, Orange, Banana. I no longer want Orange selected. If i try to delete the Orange text, it doesn’t work. The only way I’ve found to do this is to delete all contents of the cell, then go back and select Apple and Banana from the dropdown. Hello Shelley.. This is the drawback of using a drop-down list here. 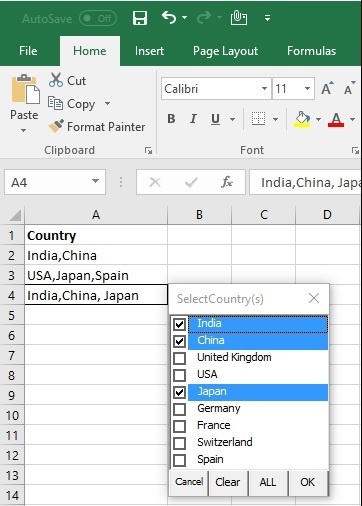 As soon as you delete an item and hit enter, Excel takes it as another entry that you are trying to make, and shows an error since that’s not a part of the drop down. Hi, this code seems to be working well for me, but can you tell me if it’s possible to ensure that once the selections are made they appear in alphabetical order? Me too. I need any suggestions for this case. Hello I add the code to be used in C8 for 2 spreadsheets, the drop meny works only in C8 but I want it to be working until C200, please advise. Hi there – I tried to use this code but it is not allowing me to add multiple values in 3 of my columns. Actually – it is working in all columns but only in cell 2 on each. Yes same issue – actually I abandoned this option because I wanted to be able to filter on just one value within the whole field (set of suburbs for the South in one and wanted to filter on just one of those suburbs) but it won’t allow me to filter that way. This worked great thanks, this question leads on from what I have now achieved with this code. Now that I have selected multiple entries in some cell (I have applied this code to an entire column) but not all, I would like to filter down to entries within that column, ie find all entries that contain orange or blue. So I have applied the usual filter to my heading row but when I click on this I would like the options to filter to appear the same way it would if there were only one entry in each cell, but it has the lists/multiple entries as options. Basically I want filter function to comma separate my lists I guess? Does that make sense? Any suggestions? I can just type in the colour in the search option under filter but that doesn’t work if I want multiple colors at once. I am having an issue with the code. My lists are in sheet 2, but my drop downs are in sheet 1. How do I need to change the code to accommodate this? Thank you! Great solution. How can I get each entry to go into an new line (issuing a line feed after the selection? another thing how can I defind that with in a table in excel and that it could move automaticly with the table? hi, followed this thread found it the most helpfull, but I need to tweek it a little bit more. I need the selection to be words (strings) and after the selection the return value needs to be a sum of numbers, each word get its value – a number. please help, I have been struggling with this one for three moths now. Thank you, this has been very helpful. I have set up multiple selection list in L5 using your code. In M5, I have a dependent selection list that recognizes a selection in L5. However, I am having trouble with this dependent list recognizing multiple selections. Any thoughts? This is a great solution for MS Excel, do you have any idea if something similar would work for MS Project? How do I make the macro work on a range of cells? For example cells L2 through L10000. 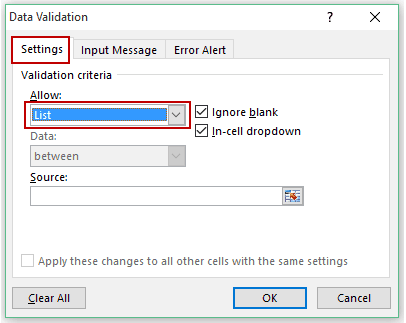 This worked on the one cell – allowing multiple selections in the same cell with a comma between. If Target.Column = 6 AND Target.Row > 1 AND Target.Row < 10001 ThenI can not longer select multiple selections in the same cell. What am I doing wrong? Change the references to what you want. Hi Sumeet. I have tried your code suggestions and it works I have even tried 4 drop down list multiple selections and it works. Just one question, when I save my work I am askes to save as a macro sheet. Is this the only way to save. What is your sugestio on the safest way to save. I may want to share this with others as well and they must be able to open the file. You’ll have to save it in either .XLS or .XLSM format. Since it contains a macro, you can’t save it in the .XLSX format. Once you save it, it won’t show the prompt again. You can also share it with other people and there shouldn’t be any issue. Help…saved as .XLSX format but when I save, close and reopen the coding is gone! Hi Sumitji, I am wondering if there is a solution to this question. I “save as” and on the copy, the code is gone and I can no longer make multiple selections from the drop down list. I am creating a mental health treatment plan template so I would like to be able to use this template over and over again for new patients. Any ideas on how I can “save as” and retain the code and formatting? Hi Sumit. Is it possible to have another drop down list under a different column? If yes, how do I do it? Thank you! This is really great, I’ve been looking for this option. My question is, I’ve followed your instructions from above to modify the code and get it working on just one column, in this case column 7. However, I’d like to get it working on column 6 too but instead of having the comma seperate each value I want to use a hyphen instead. So currently on column 7 the output is “1, 2, 3, 4”. On column 6 I want the output to be “1-2-3-4”. I’ve played around with the code a bit but I can’t seem to get it right…any suggestions? Is this code in addition to the original code in the tutorial? You didn’t specify if this is a replacement or in addition to. TIA. Great tutorial by the way. Hi Sumit, I have run into a snag. I started with your code at the top of the thread and started making changes based on your recommendations. 1. Allow for multiple selections. (First code given on page) -Works. 2. changed the code from Target.address = “$C$2 Then to If Target.Column = 10 And Target.Row > 3 And Target.Row < 43 – Works. 3. I changed the code per your recommendation so you can't select the same option again. – Works. Second Question, From a user experience perspective do you have a way to do this with Checkboxes so you can select all at once (either selecting or deselecting) the radio buttons for each item? Were you able to find any solution for deleting/removing previously selected items? I usually just right click on the cell and choose “clear contents” and then I can start over. Thanks for the code! Can you please let me know how can i deselect an entry?I am not able to delete an entry manually. this is really cool! thanks a lot! Can I have combine with the drop down ists in Excel without Repetition? Hello Anu.. Below is the code you can use. If there is already a value in the cell and you select it again, it will not append it to the existing value. Here is VBA code included with video for drop down list with multiple selection that also allows you to remove previously selected items by reselecting them. Whenever I close the excel file and re-open the code disappears. I have to re-paste the code every time. Any solution? you have to enable macros when reopening. Is it saved as macro-enabeled workbook? Hi, followed this successfully, thanks for the tips. That said, I’m unable to replicate using this code, even when using “Or” commands along the “$C$2” line, to have the code apply to more than one drop-down list within the main workbook. Can you advise me on how I can write/adjust the code such that I can have multiple drop down lists where I am able to select more than one option? For clarification, I want to build a matrix/table where I can select multiple drop-down options across 3-4 columns and 25-40 rows. So, wondering how I will need to adjust the “$C$2” part of that code to include the code for all of the cells in which I’d want to do a multi-select. That make sense? Also remove one the END IF from the end of the code. Hello. This information was vital, thanks. But if I don’t want to apply the code to all the drop downs in the worksheet, only in on row? For example, only in g5:g53? Hello Sumit; thank you so much, it was just what I needed. I want to apply the VBA Code to cells C7:C80. Is the following correct “If Target.Column = 3 And Target.Row > 6 And Target.Row < 81 Then"? Thanks! Thank you Sumit! It worked for me today. Happy New Year 2018! When I did this it worked for the drop downs but it also caused every cell to show multiple entries. Is there a way to apply it to a specific number of cells, say 5. Thanks in advance. Hi Sumit – Thank you for this wealth of knowledge! I am trying to apply this code to 3 different drop down lists in the same worksheet – cells P7:P70; AD7:AD70 and AH7:AH70. How can I do that? Thank you! Never mind…figured it out! Thanks for the post/information though! ‘ I just swapped out Target.Address for Target.Column. Tested and working. Hi Sumit, This is really helpful but I’m not sure which “END IF” to remove. There’s three in the code, do I remove all three? Sumit – I was wonder if you could assist me. I have a column titled ‘Services’ and have created dropdown list in each cell. The worksheet has about 186 rows (and growing). I used this code to be able to select multiple and have them show up in each cell. I took out ‘IF Target.Address = “$C$2” Then and one END IF and not it works for all cells that has the dropdown list. HOWEVER, whenever I type anything in any other cell, it doubles/replicates what I already had in there plus what I was typing. I’m guessing that is because of the code I put in for the dropdowns. Could you help?